For a significant portion of the United States and other parts of the world, we are a little less than one month away from a tremendous astronomical experience. August 21, 2017 marks the date for the next Total Solar Eclipse and the first time in over 38 years that it will be visible across most of North America. 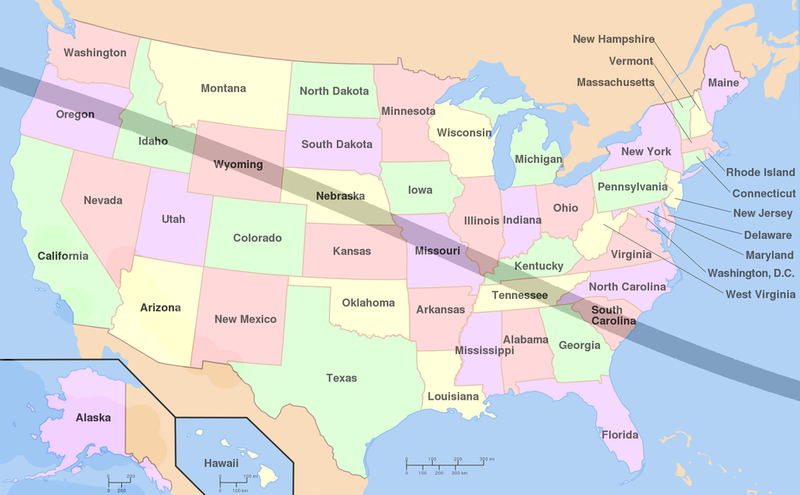 The path of totality will occur at various points across 12 states in the USA; Oregon, Idaho, Wyoming, Nebraska, Kansas, Missouri, Illinois, Kentucky, Tennessee, North Carolina, South Carolina and Georgia. Other parts of the world will experience a partial eclipse; United States, Canada, Central America, Mexico, the Caribbean Islands and Northwest Europe1. A solar eclipse occurs when the moon is in new-moon phase and sits between the Earth and Sun in perfect alignment. The combination of the sun’s size, 400x larger than the moon, in relation to the sun’s distance, 400x farther away, means that in our sky the moon and sun are the same size. There are three different forms of solar eclipse2. A partial eclipse is exactly what it sounds like, moon and sun are only partially aligned. The moon appears to take a bite out of the sun leaving a large part of the solar surface uncovered. These are the more common types of eclipses and are seen by a greater portion of the world. For those that are not on the path of totality on August 21, you will see varying degrees of a partial eclipse. An annular eclipse occurs when the moon and sun are slightly off in their alignment, typically when the moon is at apogee, meaning farthest away. This throws off the apparent size of our sun and satellite allowing for a visible ring of solar activity to appear around the moon when at totality. A total eclipse, as will be witnessed next month, happens when the moon and sun are at just the right distance from earth and the alignment is exact. The moon will fully cover the sun’s surface blocking out all light and allowing those on the path of totality the ability to observe stars during daylight hours. As most of us have been taught since early childhood, it is not safe to look at the sun at any point in time for any length of time. It is for this reason that many safe ways have been developed so that we can observe without threat to our vision. The most common and least expensive method is using solar glasses. These card board optics have solar film that restrict the amount of sunlight received while also blocking out all but the sunlight. With these glasses you can observe an eclipse at all stages of its activity. There are also various forms of filters and lenses that can be used in combination with binoculars and telescopes to provide the same safety and security while maximizing the image. With these enhanced types of equipment, you can observe not only the eclipse but also see activity on, sunspots, and around the sun, prominences, and flares, that solar glasses wouldn’t naturally pick up. The next total solar eclipses will occur July 2, 20193 and totality will be visible from only central Argentina, central Chile and the Tuamotu Archipelago. Parts of South America, southern Central America and surrounding islands will see this as a partial eclipse. It will be five more years after that before the United States will experience another Total Eclipse whereas, Europe will need to wait until 2026 and northern Africa in 2027. With a month before the big August event you still have time to make plans. Various online resources are still selling safe solar equipment and many towns and cities on the path of totality will be hosting festivals and gatherings to witness this occasion. If you can’t make it far enough for the full effect, you can still experience the eclipse in its partial form. There will be many news and web outlets, as well as individuals, live streaming the experience. Don’t let your locale keep you from the event.